My coven, Circle of Fountains, was formed back on the Spring Equinox of 2014 as an alternative to more standard coven hierarchy. We strive to be a circle of equals, both in responsibility and leadership. Each Primary Member leads one sabbat and one full moon esbat ritual every year, teaches two of the twelve Novice classes and takes on one responsibility to the group, such as inventorying or pot luck coordination. All of this ensures that no one member is taking on the bulk of the responsibility to the group, with minor exceptions to the Circle Coordinator (myself). I've talked extensively about our membership roles and expectations in the past. 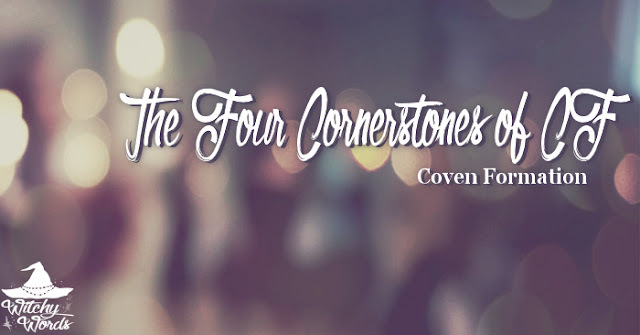 It was in the latter that I was asked about our cornerstones and I'm certainly happy to elaborate! Because Circle of Fountains is relatively unprecedented in its structure and formation, our cornerstones developed over the first year of our creation as I asked my coven what was most important to the heart of CF. What was our focus? What did we want to achieve? What should each member or potential member strive for? Circle of Fountains is a witchcraft coven but, in that, we serve no one denomination. We welcome members of all paths and religions (or non-religions as the case may be) as long as witchcraft is the core of their practice. In our coven, we laud differences in beliefs and practices, emphasizing the wide variety of traditions as an integral part of community and togetherness. This acceptance allows us to experience the whole of what witchcraft is and can be by our natural structure; each member that leads a sabbat or esbat leads it in their own style of ritual, stretching our members beyond their standard boundaries and opening them to a variety of life experiences and customs. Members of Circle of Fountains strive to bring about positive changes in their lives through self-acceptance, progress, togetherness, ritual and community involvement. It is expected that each member is both inward and outward focused. Inward, coven members should be goal-focused and driven, striving for growth in their practice as well as their personal life. Our rituals follow this path of positive growth, encouraging it through energy work and spells, shadow work and mindfulness. Outward, members are expected to participate in the local community, be it through public ritual, classes or other volunteer work. Circlemates are expected to give back to the community that helped us come together. Practical covers two key points of our circle: Physical world changes and safety and comfortability. The former recognizes that magic is not a replacement for physical world efforts. Science is at the core of Circle of Fountains and its members are expected to be aware of how their spiritual practice coincides with it. This includes things as mundane as applying for a job and as essential as emergency medical attention. In that, safety and comfortability supersedes all other attributes of our circle. We expect our members to be careful, take the appropriate precautions and know their limits. If we feel you are being unsafe in some way, we will ask that you take action. If you cannot take action, we will take appropriate action for you if needed. This includes calling 911 if we feel you need it or relinquishing you from the group if you are putting other members in danger. The final of the four cornerstones speaks about the open nature of our circle and rituals. While our circle is private attendance, we strive to be open online in an effort to educate and be inclusive towards other pagans and witches who may not have access to community or who may not be open with their beliefs. All members agreed that they wish they had access to something like this when studying early on, and thus it is essential to who we are as a circle. Because of this, all members naturally must be over 21 years of age, consent to being photographed and consent to those photographs being posted online. Admittedly, as a relatively new circle having just rounded our third anniversary, we are still building on our functionality. Next year, we'll be buckling down to evolve our group and our Noviceship courses. As we evolve, things certainly may change. All of that being said, our four cornerstones will always be an essential part of who we are as a circle. I LOVE all of the cornerstones that you discuss -- but the nondenominational one really catches my eye. So many of the local covens where I am at are very much God & Goddess, typically within the Greek/Roman or Celtic pantheons, and I would venture to guess that 80% of the covens are Wiccan or heavily Wiccan influenced. Thank you so much! When forming CF, I didn't want to corner any one member into a specific practice. CF was not going to teach a tradition and a change of beliefs was not going to ostracize a member. Our paths are so fluid and individual that I couldn't imagine forcing a person to mold to the coven; rather, I felt, the coven should mold to the person. So far, it's been an amazing experience!